Markets continued an upward trend amid a day of mixed messages on the trade war front. According to the US Soybean Export Council, Chinese importers bought 1.5 million to 2 million tonnes in the nation's first significant purchase of US soya beans since July, a first step in holding up agreements made in the Dec 1 meeting between US President Donald Trump and Chinese President Xi Jinping. The Wall Street Journal also reported that China is revising its Made in China 2025 industrial policy, potentially delaying some targets in its plan to dominate high-end technologies and providing greater access for foreign companies. This could help ease tensions with the US, which has called for concrete timelines and actions from China to balance trade and open its markets to foreign companies. FXTM research analyst Lukman Otunuga noted that the positive effects of easing trade tensions may be short-lived. "Global equity bulls remain threatened by concerns over plateauing global economic growth, Brexit turmoil and political risk in France among many other geopolitical risk factors," he wrote in an afternoon report. Still, the Hang Seng Index picked up 1.29 per cent to close at 26,524.35, the Shanghai Composite Index advanced 1.23 per cent to 2,634.05 and the Shenzhen Composite added 1.11 per cent to 1,360.92. Japan, Australia, South Korea and Malaysia all closed higher. 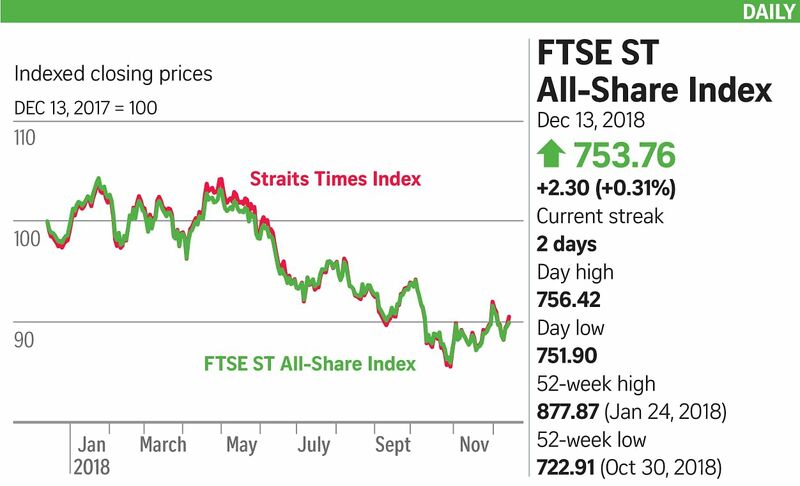 Singapore's Straits Times Index (STI) advanced for a second session, climbing 0.36 per cent or 11.09 points to 3,111.08. It closed up 1.33 per cent at 3,099.99 on Wednesday. Half of the 30 STI constituents ended the day in the black, and turnover was 891.4 million shares worth $893.1 million, with gainers and losers matched. Thursday's most heavily traded counter was casino operator Genting Singapore on a volume of 36 million shares. Its shares rose 1.5 per cent or 1.5 cents to close at $1.01. A Bloomberg Intelligence report on Wednesday highlighted Genting as one of two leading candidates in the competition for a casino licence in Osaka, Japan, which will be hosting the World Expo 2025. "The proposed Osaka integrated resort is near Universal Studios and the Osaka Aquarium and would add more attractions and demand drivers to the area. This is key to supporting our forecasted US$2.7 billion (S$3.7 billion) in casino revenue," the Bloomberg analysts wrote.